Vunipola's Instagram post backing Folau read: "I don't HATE anyone neither do I think I'm flawless". "It was made clear to Israel in writing and verbally when I met with him a year ago that any social media posts or commentary that in any way were disrespectful to people due to their sexuality would result in disciplinary action". "When you play in the gold jersey, we're representing everyone in Australia - everyone that's out there supporting us". "We've had the discussion about it after the last time about his right to believe and our support in that", he said. 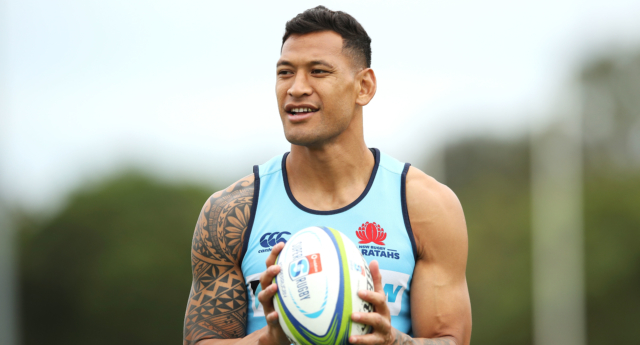 Many of Folau's supporters have suggested that he is being persecuted for his faith - something which the player himself said that all Christians should expect to happen if they hold fast to the truth of the Bible. "If that's not to continue on playing, so be it", Folau said. Saracens director of rugby Mark McCall said "I'm sure there's stuff going on in his head" but will pick him for Saturday's European semi-final against Munster at Allianz Park. "I share it with love". Folau, who broke the record for Super Rugby tries earlier this month, also tweeted a screenshot of the news that Tasmania last week became the first Australian jurisdiction to make gender optional on birth certificates. "But my faith in Jesus Christ is what comes first", he told the publication. In an interview with the Sydney Morning herald, Folau was unrepentant about his social media posts and said he would leave the outcome in God's hands.